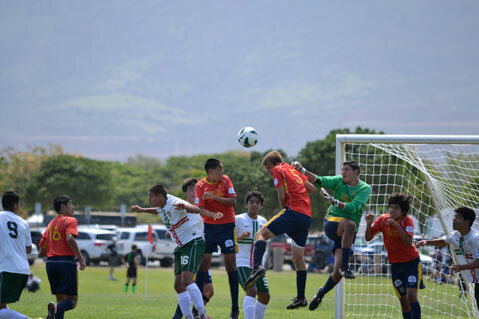 <b>HEAD SHOTS: </b> Santa Barbara Soccer Club’s Boys U15 earned the title at the Far West Regional championships in Honolulu, Hawaii, last month. The team beat out 13 opponents from eight states. It was the second year in a row U15 came in first in the competition. S.B. players included (from left, in red) Eric Contreras, Juan Pablo Alvarez, Cason Vom Steeg, Edward “Lalo” Delgado (goalie in green), and Francisco Arroyo. The Miami Heat did it in the NBA Finals. The Santa Barbara Foresters did it in the National Baseball Congress World Series. Spain could do it in the World Cup (but Brazil served notice that it will be an exceedingly difficult task). Later this month, the Boys U15 team of the Santa Barbara Soccer Club will try to do it — win back-to-back championships at the ultimate level of competition. The penultimate step for the Santa Barbara boys was their second consecutive Far West Regional title. They finished as the best of 14 teams from eight states in the tournament last month at Honolulu, Hawaii. They will join five other regional champions at the U.S. Youth Soccer National Championship on July 22-28 at Overland Park, Kansas. This is the fourth summer the same boys have stood out among their peers. When they were in the U12 age group, they won the regional in New Mexico, and that was as far as they could go. Their first bid to reach the nationals ended in a defeat at the U13 regional finals at Lancaster. Last year, Santa Barbara won the U14 regional at Phoenix, Arizona, and took the U.S. title at Rock Hill, South Carolina. <b>BOUND FOR GLORY:</b> “The majority of these young men will play in college,” Coach Rudy Ybarra said of his winning team members, pictured above after becoming 2013 regional champs. Even as their coach, Rudy Ybarra, has seen the team grow in its command of soccer skills and tactics, its journey has become increasingly perilous. Santa Barbara had to win penalty-kick shootouts against two other California teams — the Pateodores Academy of Orange County and FC Golden State of the Greater Los Angeles area — after both the semifinals and finals at Honolulu ended in 1-1 deadlocks at the end of regulation and overtime. Stepping up to make PKs in the stress-drenched shootouts (Santa Barbara won the semi 4-3 and the final 4-2) were Francisco Arroyo, Eric Contreras, Benji Garcia, Tim Heiduk, and Lucky Puengrod. Garcia and Contreras, a pair of Carpinteria youths, scored goals in regulation time. Key defenders included Gio Acosta, Carson Vom Steeg, and goalkeeper Edward “Lalo” Delgado. Other members of the team are Tony Andoyan, Juan Pablo Alvarez, Jacob Blacker, Shea Blackman, Sahid Conteh, Brian Finger, Raul Guerrero, Tanner Mees, Jules Pasco, and Brandon Sanchez. Most live on the Santa Barbara coast; a few are from Ventura, Santa Ynez, and the North County. Vom Steeg, the son of UCSB soccer coach Tim Vom Steeg, was one of 36 players invited to the U14 national training camp in the fall. “The majority of these young men will play in college,” Ybarra said. The club is seeking financial support for its trip to Kansas. “The parents are paying so much, and they get some help from U.S. Soccer and Region 4, but it’s an expensive deal,” Ybarra said. 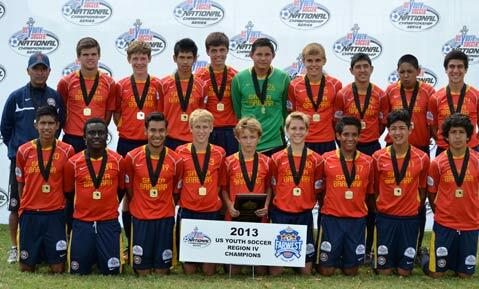 Tax deductible donations can be made by mail, payable to: SBSC-BU15 White, Road to Kansas, P.O. Box 60208, Santa Barbara, CA 93160. OLD-SCHOOL MOTIVATION: During Game 3 of the NBA Finals, San Antonio coach Gregg Popovich was heard exhorting the Spurs not to be shy about shooting three-pointers. “You feel confident, let ’em fly,” he said. “Get your name in the paper.” ESPN’s Stan Verrett scoffed at that approach. “Who reads the paper anymore?” he said. Ouch. But there must have been some readers in the family of Danny Green. His long-distance shooting sparked the Spurs to a 113-77 blow-out victory. FIRING UP THE FORESTERS: Joey Epperson’s debut week with the Santa Barbara Foresters may not have been as dramatic as Yasiel Puig’s with the Dodgers, but it was still quite impressive. Epperson, an outfielder at SBCC and UCSB, hit for a .458 average with eight RBIs in six games. The Foresters will play a Fourth of July game at 4 p.m. against the MLB Academy Barons at Caesar Uyesaka Stadium. It’s the first game of the Rawlings California Cup tournament, which will continue through the weekend at the UCSB diamond. INTERNATIONAL SOCCER: Rudy Ybarra will send his semipro team, the Ventura County Fusion, against Puebla FC of Mexico’s La Liga on Tuesday, July 9, at the Ventura College Sportsplex. The Fusion, which plays in the Southwest Division of the nationwide Premier Development League, has several players from UCSB and Cal Poly. Puebla, a two-time Mexican champion, features an international roster including DaMarcus Beasley and Michael Orozco of the U.S. national team. Kickoff Tuesday is at 7 p.m.